My sister asked me to paint an aquarium for her. 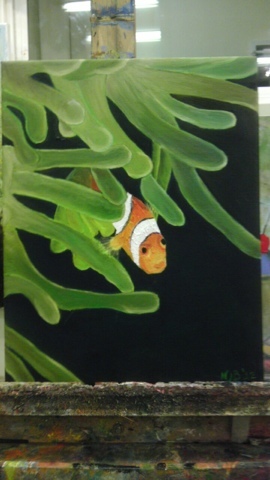 Done the way that I envision it in my head, I knew that it would take a lot more time and perhaps expertise than I felt like I had, so I committed to doing a study of something aquatic: a clown fish in an anemone. I really like that. It has a quality to it that makes it look like you're actually in the ocean. Might be some time before I work on the full aquarium. I thought that this would be easier because it's on a smaller canvas than I usually use. Not so.